Description: Standard 22 AWG solid Black hook up wire. Use this with your bread board or any project in which you need sturdy wire. Comes in small spools of 25'. 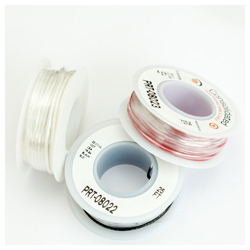 We love this wire, it's a solid wire that looks like the same type that comes in break board kits with those pre-cut pre-bent wires. Except with this wire you can make your own lengths so that they fit were you need.